The ankle is a hinge type synovial joint that involves the superior part of the talus foot bone and the distal end of the tibia, and fibula leg bones. It is mainly responsible for the dorsiflexion and plantarflexion of the foot. Both actions are produced by the muscles of the anterior and posterior compartments of the leg. The strong interosseous ligaments anchor the distal end of the smaller fibula with the larger distal end of the tibia. That creates a deep bracket-shape socket for the upper part of the body of the talus. The socket’s inferior and medial surfaces are formed by the distal end and medial malleolus of the tibia respectively. Its longer lateral surface is formed by the lateral malleolus of the fibula. The trochlea is the pulley-shaped superior articular surface of the talus. The malleoli hold the talus tightly as it rocks within the socket during movements of the joint. The hold is strongest during dorsiflexion, and looser during plantarflexion. This is attributed to the talus’ design: wide anteriorly and narrow posteriorly. The joint capsule of the ankle is thin, but reinforced on each side by the strong compound lateral (consisting of the calcaneofibular, anterior talofibular, and posterior talofibular ligaments) and the large medial (deltoid) collateral ligaments. A fibrous membrane, lined with a thin synovial membrane, attaches to the adjacent bones. The vascular supply of the ankle comes from arteries derived from the malleolar branches of the fibular,and anterior and posterior tibial arteries. It is innervated by nerves arising from the common fibular nerve, the tibial and deep fibular nerves. The foot is the most distal region of the lower limb, located below the ankle joint. It is subdivided into the ankle, metatarsus, and digits (toes). There are five digits: the medially positioned great toe (digit I), and the four laterally placed digits that end with the little toe (digit V). The foot is the body’s contact point with the ground. It provides stability and levers the body during movement. The foot consists of three groups of bones. The tarsals are seven bones (talus, calcaneus, navicular, cuboid, and the lateral, intermediate and medial cuneiform bones) that form the skeletal framework of the ankle. The metatarsals, numbered from I to V, are the bones of the metatarsus. The third group contains the phalanges, the bones of the toes. Like with the hand, each toe has three phalanges (proximal, middle, and distal), except for the great toe that only has two. The foot contains twenty individual muscles, fourteen located on the plantar aspect, two on the dorsal aspect and the remaining four are intermediate in position. From the plantar aspect, muscles of the sole occur in four layers within four compartments. Despite all the layering and compartmentalization, plantar muscles function as one unit. Muscles of the foot are of little importance when separated individually, this is because fine control of the toes is not important to most individuals. They produce no actual active movement, but instead ensure the fixing of the foot against the ground and maintaining balance. 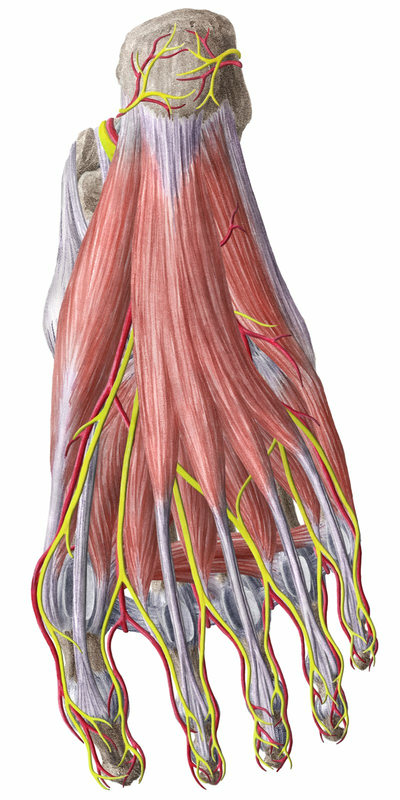 The blood supply to the foot is by branches of the posterior tibial and dorsalis pedis arteries. Its innervation is by the tibial, superficial and deep fibular, sural and saphenous nerves. Want to learn more about the Ankle and foot?